On Thursday, May 30th, join us for the first ever preseason school-day Argos game at Varsity Stadium. 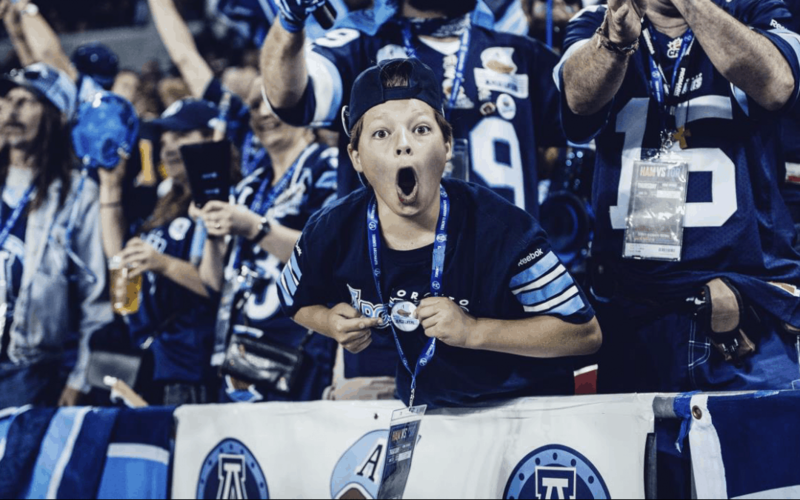 Your students can join thousands of others to cheer on the Argos as they take on the Montreal Alouettes. We’ve teamed up with Maple Leaf Sports and Entertainment again, who have arranged for an 11:00 a.m. start time. The event showcases the sport, and top athletes will encourage students to get active. A portion of ticket sales will go towards supporting students in need across Toronto. The day is shaping up to be fabulous, filled with TDSB staff and students and, of course, football! To order your tickets now please email info@tfss.ca. Time: We recommend schools arrive for 10:00 a.m. The game starts at 11:00 a.m. Ticket Price: $20 per student. $4 dollars from every ticket purchased will go towards supporting students in need across Toronto. Seating: Seating will be assigned on a first pay first served basis. Ordering tickets: Email info@tfss.ca to secure your tickets. Please include your school name and how many tickets you would like. All tickets purchased are final sale. Looking forward to seeing your school in the crowd!